Before I proceed, I just want to say that none of this was well thought out, so I’m just writing whatever comes to mind without starting to cry. I’ve been a Gleek from the very beginning. But if I were to be honest, I was a bit hesitant to start watching it because I immediately thought they were turning High School Musical into a television show. Don’t get me wrong, I loved HSM, but one could only take so much. Anyways, I learned that I was wrong and it was more than that. Whenever I felt down, I’d turn on some Glee tunes or an episode and sing/dance along to the music as if I was somehow part of that number. The same goes for whenever I was pretty excited or happy about something. The Glee fandom made me feel like I was part of something special and that’s one thing that drew me in. When I was in high school, I was part of colorguard/winterguard. I made friends; I got lost in the music and performance. I felt like I was part of something special, but after I graduated, I missed that feeling. So when Glee started, for some reason I felt like I was in that classroom with the rest of the Glee kids. Not only was I singing or dancing with them, I was laughing and crying along with everyone. Sometimes I even wish my high school experience was like what I watched on the show. I fell in love with the characters, each and everyone of them. And I felt like I was able to relate to most of them to an extent. I saw little bits and pieces of myself in these characters and some of them I wanted to strive to be like. Sometimes I put up a facade like Quinn or Santana. Sometimes, well most of the time, I dance in front of my mirror like Mike. I sometimes feel like I’m Mercedes from season 1, where I’m self conscious about my weight. I have my oddball moments like Brittany. Sometimes I use my shyness to push people away like Tina did. I want to make sure my parents don’t have to worry about anything financially, just like Sam. I have self esteem issues like Marley, but I have dreams of making it big. Like Finn, I’m naïve and clueless as to what I want to do with my life, but I’m still optimistic. And just like Rachel Berry, I want to follow my dreams and make it in the world. I could go on and on with the rest of the characters but the main thing is that each of them were different, but they all came together and became a family over the years. They all learned to work as a group, but stayed true to who they were as individuals. And that’s what Glee is about. It’s okay to be quirky. It’s okay to be passionate. It’s okay to be who you are. And not only did I fall in love with the characters, I fell in love with the cast and crew. 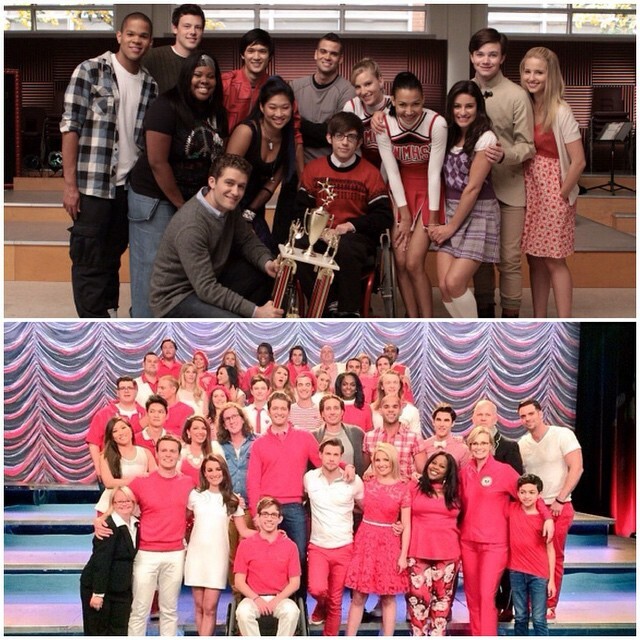 Glee was one of the first television shows that everyone started talking about on social media. Through different media channels, fans got to interact with the cast and crew and they let us into their everyday lives. That’s why this show means so much to fans. We won’t be taken into that infamous choir room or seeing the group perform on a stage and we won’t be seeing everyone together on one screen. But thank goodness for social media so we can continue to support everyone with their future projects and endeavors. Fun Fact: Glee was one of the reasons I started a tumblr and making gifs/fanart. We’ve all gotten together to support each other during 6 seasons, over 700 musical numbers, two concert tours and a movie, 15+ characters, and the loss of Cory Monteith. That last one was a tough one, and I can’t even continue writing this without tears in my eyes. Cory Monteith, will always be our awkward, tall Canadian. He’ll always be the light of the show and that half smile of his is something I’ll always remember. I’ve said it before and I say it again…I will always admire Cory Monteith’s honesty and ability to open up and just have fun. He had a big heart and the gleeks will never forget that. Both quotes sum up, in the simplest terms, what Glee means/meant to me and I think a lot of fans can agree. Glee was my happy place even during those episodes I was bawling my eyes out when there was a break up, a loss, or when one of the characters was going through a tough time. I felt like I was immersed in the show and nothing else mattered. It wasn’t an obsession, it was a passion. I had so much fun going to the concerts, going to shows where the cast had guest appearances, and meeting some of the cast. And when people associate me with Glee, I’m okay with it. I’ve embraced it. Because of Glee I’m a little more confident; I’m a little more open. I am who I am. Finally, a few weeks ago, I posted a little rant. And again I stress to former fans, don’t act like Glee did not have a positive effect on you. At one point, Glee made you laugh, made you smile, even made you believe in yourself a little more, right? Thank you Glee. You’ve made me smile throughout these past 6 years and I’m forever grateful. P.S. Since I am on the West Coast, I haven’t seen the finale yet, but you can check back later to see my thoughts on it…that is if i’m not bawling my eyes out. This entry was posted in Entertainment, Recaps and tagged Glee, Gleek, I will always love this show on March 20, 2015 by Adele Fredeluces.